World demand for rubber is forecast to increases 3.9 percent annually to 31.7 million metric tons in 2019. The share of tire and nontire applications will remain steady, as will the balance between synthetic and natural rubber. The Asia/Pacific region will be the largest and fastest growing market. 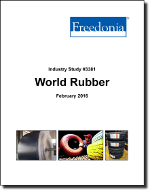 This study analyzes the 26 million metric ton world rubber industry. It presents historical demand data (2004, 2009 and 2014) and forecasts (2019 and 2024) by type (synthetic, natural) and application (tires, non-tire) for six world regions and 23 major countries. The study also considers market environment factors, details industry structure, evaluates company market share, and profiles 31 industry participants, including LANXESS, Sinopec, and PetroChina.